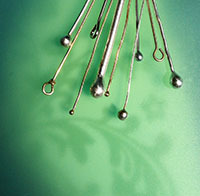 Hot, cold, dainty and bold: this workshop covers several styles of making headpins. What are headpins? 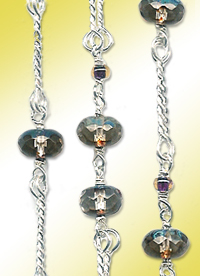 Those super cute wires that hold beads in place on bracelets, necklaces and earrings. In this workshop you will learn how to make and customize the size, type of metal, length, hardness and decorative choices (balled up, textured, paddled, invisible and eye pins). We will be working with both hot and cold techniques. Students will also form them into professional wire-wrapped loops. 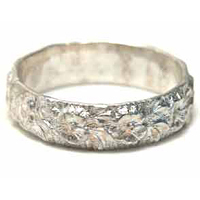 Metals used are silver, copper and brass and techniques are applicable to other jewelry metals such as gold. 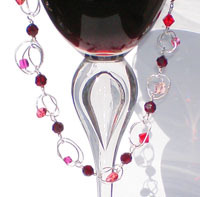 BYOB: (bring/buy your own beads for embellishment) plus magnifiers / clear safety glasses. The materials fee paid to the instructor covers all other supplies, handouts and use of tools. This compact chain is an ancient design that is still popular among Mediterranean cultures and anyone who appreciates museum-quality jewelry. Its square appearance and supple, snake-like feel appeals to both women and men. Students should already have experience in fusing. 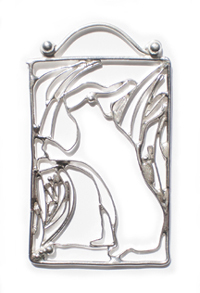 We will focus on fine tuning annealing, hammering, adding decorative elements and making a clasp. The materials fee paid to the instructor covers supplies, handouts and use of tools. Don�t forget your clear safety or reading glasses. Yehuda Tassa began to work in Yemenite Filigree at the age of six. Taught by his father, a well-known jeweler in Yemen, he worked in the family jewelry business for sixteen years. After retitring from an aerospace career, he revitalized his �lost art� of prolifically producing both ancient and modern filigree designs. He creates jewelry and teaches at various art centers in Northern California, incorporating both ancient and modern tools and techniques into his workshops. Yehuda is working to preserve the history of Yemenite Filigree through his own personal and family knowledge, his research, and by spreading the word through teaching filigree and granulation workshops. The DVD has so many inspiring examples of his filigree pieces that I lost count. I also find Yehuda�s delivery as charming as he is in person. I recommend this DVD for all levels of jewelers. For domestic shipping you can order this DVD through Pay Pal. For international orders, please contact me for additional charges and shipping time. This workshop is designed to give students a very simple introduction to soldering a bangle. Other topics include bracelet sizing, cutting, filing and polishing. In addition, students will be able to choose between different patterns, a highly polished sterling, mat, or black patina finish. What makes this soldering workshop different from others? It's kept simple, safe and non-toxic. No experience is necessary. BYOB (bring/buy your own sterling beads for embellishment). The materials fee paid to the instructor covers all other materials, handouts and use of tools. This project is built upon the premise that students have taken at least one fusing and torch soldering workshops. Due to time constraints, there will not be a review. With that said; this workshop rocks! 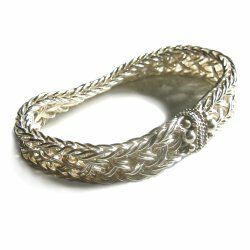 Returning students will have lots of fun combining and furthering their fusing/soldering skills to complete a complex modern cuff bracelet. The concept of interconnecting cells also lends itself to constructing pendants and earrings. Don�t forget your safety glasses and dress for a mess. The materials fee paid to the instructor covers supplies, handouts and use of tools. This is an exclusive Sandkühler Studio design. Designed to simplify fusing multiple parts, this workshop takes advantage of the product (introduced by enameling / granulation expert, Lillian Jones) Blue Fuse�. 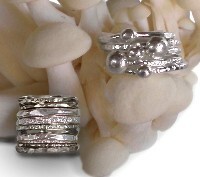 Students will learn how to size for rings, form a fused knot and add decorative granulation elements. Learn how to fuse in the 6-hour version or play with return, intermediate and advanced students in the 4-hour workshop. The materials fee paid to the instructor covers materials, handouts and use of tools. Don�t forget your clear safety or reading glasses. No, we are not casting brooms in metal. Instead, we are using natural materials such as broom straw, reeds, pine needles and roots as a surface to cast whimsical pendants with fascinating textures. This basic casting workshop will acquaint students with setting up a casting arena, using simple tools and since we are playing with fire; torch safety is also a hot topic. Finished pieces can be captured like a bead or with wire wrapping. There is no experience necessary, and the focus will be on experimentation in a relaxed atmosphere. Dress for a mess and don�t forget your reading or untinted safety glasses. 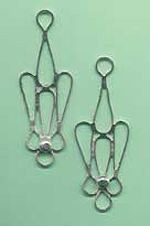 The $45.00 materials fee paid to the instructor covers supplies and use of tools. This bracelet is composed of spontaneous designs that will delight your sense of creativity. No two pieces are ever the same! 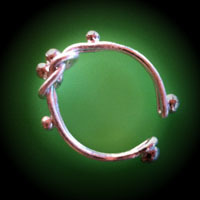 The ancient technique of fusing connects fine (pure) silver components without the toxic chemicals associated with soldering. In addition, there is no clean-up or polishing necessary. Students will also learn basic hammering, wire manipulation and cold connection. No experience is necessary. The materials fee paid to the instructor covers supplies, handouts and use of tools. 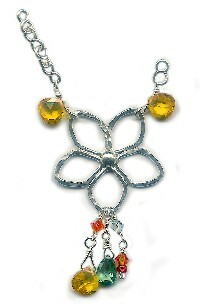 Did you know these designs are included in the distance learning lesson called "Hot Worked Chains: Fusing?" What is a distance learning class? It is a way for you to learn from anywhere in the world! These projects are the same as what I teach in a classroom except that it will be delivered to you via the internet. Click here for more information. 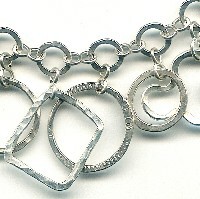 This modern Asian chain is great for making a wide bracelet, choker or belt. The ends of this design are perfect places to exercise your personal creativity. Join us to further your fusing and soldering skills. Open only to students who have had any of my fusing and soldering workshops. The materials fee paid to the instructor covers supplies, handouts and use of tools. Don't forget your untinted safety or reading glasses. What is a distance learning class? It �s a way for you to learn from anywhere in the world! This distance learning project is the same as the one I teach in the classroom except that it will be delivered to you via the internet. Click here for more information. 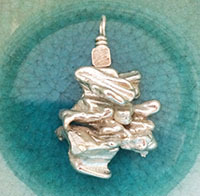 Once you have taken a couple of fine silver classes its time to begin using your scraps as a creative jumping off point to make pendants from scratch. This class will focus on experimentation using the marriage of metals combined with reticulation. The results are organic and one-of-a-kind. It is imperative that students already have at least one fusing and one soldering workshop under their belt so that the class can focus on these advanced techniques. Students are asked to bring their fine silver scraps (to add to what will be provided), grungy (natural fiber) clothes and glasses (prescription, reading or clear safety). The materials fee paid to the instructor covers all other supplies, handouts and use of tools. 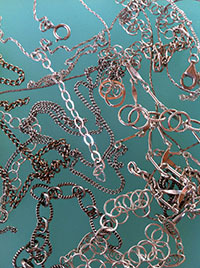 Left over metal scraps are an inevitable by-product of the prolific jeweler. 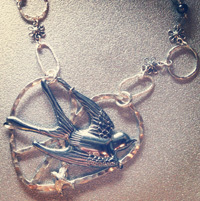 Join us in this hands-on workshop dedicated to turning your scraps into one-of-a-kind jewelry. Other topics include understanding alloys, the refining process and exploring your personal iconography. The materials fee paid to the instructor covers supplies, handouts and use of tools. Derived out of the original Hugs and Kisses workshop developed in 2004, this project and technique grew under the influence of owners Jamie and Jason of The Bead Gallery in Honolulu. In 2007 Jamie asked me to prepare samples to teach the Hugs & Kisses project. She requested that I modify the design into a 5-petal flower no more than 1 1/2� across. The Daisy version premiered on their website and as a workshop on September 3, 2008. During the class Jason and I experimented with transforming the daisy into a more complex lotus blossom that captures cabochons in its center. 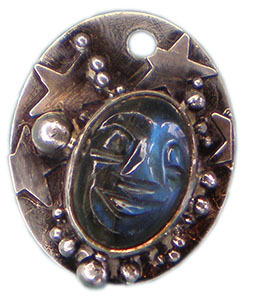 This advanced fusing workshop is available to students who have had a lot of fusing practice. BYOB: bring your own bead box, flat- and pointed back- stones to add to the classes options. The materials fee paid to the instructor covers all other supplies, handouts and use of tools. 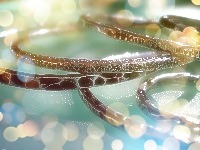 Fusing is an ancient technique used to permanently connect precious metals. Cleaner, faster and less toxic than soldering, it is a great introduction to torch work. Already know how to use a torch? Come and further your fire-manipulation skills. Besides fusing, students will also learn how to: measure for rings, explore various hammering techniques to create surface texture, stretch metal, punch holes, wire wrap and explore/discuss various polishing options. No experience is necessary. Don�t forget to bring your untinted safety or reading/magnification glasses. BYOB: bring/buy your bead box for embellishment choices. The materials fee paid to the instructor covers all other supplies, handouts and use of tools. 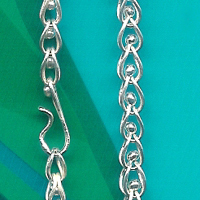 This easy chain link will not leave you feeling (con)fused, loopy or twisted! On the contrary, you�ll be amazed at how easy and straight forward these techniques are. 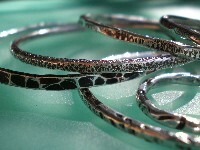 Students will focus on fusing, learning the limits on twisting metal as well as how to create a simple S-Hook. BYOB: bring/buy your favorite beads to express your individual color palette. Don�t forget your reading (or non-tinted) glasses for safety! No experience is necessary. The materials fee paid to the instructor covers supplies, handouts and use of tools. Exclusive Sandkühler Studio Design. 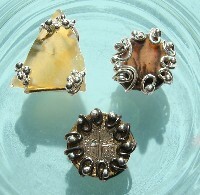 Fusing is an ancient technique used to permanently connect fine silver and gold. Cleaner, faster and less toxic than soldering, it is a great introduction to torch work. 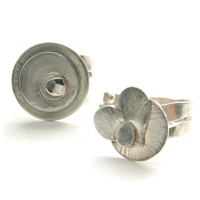 Students will work with fusing thick gauges of wire, surface texturing and polishing. Already know how to fuse or use a torch? Come further your fusing phat fat wire skills! No experience is necessary. Bring non-tinted safety or reading glasses. The materials fee paid to the instructor covers all materials, handouts and use of tools. 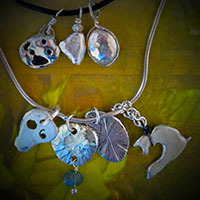 If you�ve had fine silver, torch-fusing experience, than this workshop is for you! We take fusing to the next level by playing with more advanced, interlocking shapes that hold tight to stones. BYOB: bring your own bead box, small stones and crystals to reflect your personal color palette and to add to the options in class. Don�t forget your untinted safety (or prescription) glasses. The materials fee paid to the instructor covers all other supplies, handouts and use of tools. 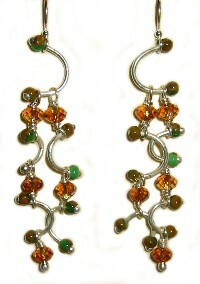 Befuddled by fusing while using beads? 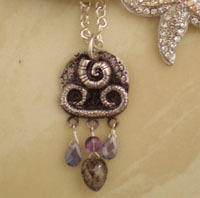 Come learn the secrets of creating delightfully delicate beaded jewelry components. Don't for get your reading or untinted safety glasses. The materials fee paid to the instructor covers supplies, handouts and use of tools. 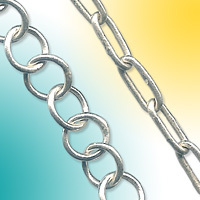 Did you know you could permanently connect fine (pure) silver chain links without the toxic chemicals associated with soldering? In addition, there is no clean-up or polishing necessary. Explore the ancient art of fusing, using simple tools such as butane torches, pliers and kiln bricks. Learn how to expand your designs through theme variations and hammering. 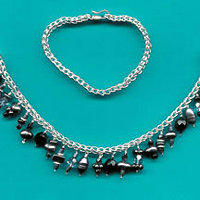 Students will also learn how to fuse a clasp. No experience is necessary. The materials fee paid to the instructor covers supplies, handouts and use of tools. The 6-hour workshop provides students with the time to complete a piece of their choice. Why spend all of that time designing a unique, handmade chain and then top it off with a manufactured clasp? 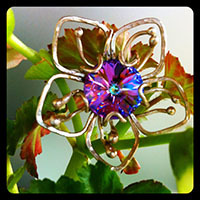 In this workshop students will learn how to make several types of hot-worked clasps. 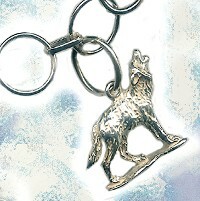 Focus will be on fusing fine silver combined with wire-working and hammering techniques. Design choices range from simple to complex and students are encouraged to experiment. No experience is necessary. The materials fee paid to the instructor covers supplies, handouts and use of tools. More Pics! How Do You Mend a Broken Chain? Got Parts? Bring them to class for discussion and possible use. We will cover various strategies to repair sterling, 14K gold-filled, copper and brass chain. Clasps will also be considered. Students will have the hands on experience including simple cold solutions and hot (soldering) techniques. Don�t forget your untinted safety and/or magnifying glasses. No experience necessary. The materials fee paid to the instructor covers supplies, handouts and use of tools. 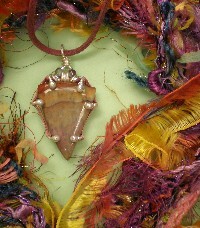 This workshop is designed for students who have no fear of fusing. If you've taken the Hot Worked Chains: Fusing workshop and the Seven Circles Ring and you are comfortable with melting down your work occasionally, then you will find this class exhilarating and fun! Students will learn how to manipulate the flame to fuse multiple shapes together. Strategies include techniques to harden the pendant and connecting multiple units. The materials fee paid to the instructor covers supplies, handouts and use of tools. Exclusive Sandkühler Studio Design. Elements of this design represent the logo type for the Latin word IO, meaning joy. Using this original Sandkühler pattern, students will continue to explore new combinations of hot techniques to create complex, linear shapes. Are you a beginner? Take the 6-hour version. Have you had fusing? Then skip to the 4-hour session. The materials fee paid to the instructor covers supplies, handouts and use of tools. This workshop is designed to give students a simple introduction to soldering a ring. Topics include sizing, cutting, filing, texturing, polishing and patination options. Students will be able to choose between pattern stock and making a ring from sheet and wire. As always, we keep it simple, safe and non-toxic. No experience is necessary. Don�t forget your non-tinted safety or reading glasses. The materials fee paid to the instructor covers supplies, handouts and use of tools. This contemporary peacock pattern was derived from the classical loop-in-loop system. Students will learn how to create and combine links using non-toxic materials and low-tech tools. This workshop is perfect for the urban and suburban dweller that has limited space but wants to create professional jewelry. Join us and learn the tricks that make fusing a breeze. The materials fee paid to the instructor covers supplies, handouts and use of tools. Students will learn how to fabricate a traditional bezel consisting of a base plate and bezel wire to permanently secure their quarter-sized (or smaller) cabochon, sea glass, pebble, flat backed beads or stones. Detailed discussions include resources, determining appropriate size and shape of stone, soldering strategies, surface treatment and embellishment, troubleshooting, use of various tools and common household objects as tools. BYOB (bring your own bead box for possible embellishment and any tiny treasures that you consider setting). Because of time limitations it is imperative that students have torch soldering/safety experience. As usual, there is an emphasis on keeping it low-tech and toxic free. The materials fee, paid to the instructor covers supplies, use of tools and handouts. Ideal for someone who has never used a torch, this workshop focuses on gaining familiarity with butane torches through the use of repetition. 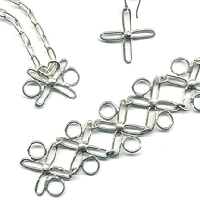 Students will learn how to draw a bead in fine silver, to create the versatile matchstick chain-link design. Additional topics include how to set up a safe working environment, discussion regarding the practicality of using other types of torches and resources. No experience is necessary. The materials fee paid to the instructor covers supplies, handouts and use of tools. Exclusive Sandkühler Studio Design. Matchsticks & Torches 2: Color! This workshop includes all the topics covered in Matchsticks and Torches 1: The Original, plus discussion and practice of adding glass to color the matchstick heads. This is ideal for someone who has never used a torch or students returning to further their skills. No experience is necessary. Don�t forget your non-tinted safety or reading glasses. BYOB: bring your own beads (and findings) if you already have them, otherwise, don�t invest in anything new for the class. The materials fee paid to the instructor covers all other supplies, handouts and use of tools. In this workshop we will combine the basic matchstick concept and wire weaving to assemble a bezel basket. This setting is perfect for capturing traditional and irregularly shaped stones materials. Students should bring their favorite collection of stones, gemstones, beach glass or coins. Any shape works! Don't forget your untinted safety glasses. All other materials, handouts and use of tools are included in the fee paid to the instructor. Organic in sensasbility, these prong settings are an excellent way to capture and embellish stones, beach glass, coins etc... Once students understand the basic concept, they can re-size their technique to accomodate larger and smaller pieces. Because of time limitations, it is imperitive that students are skilled in fusing and have had a Matchstick (or similar) workshop under their belt. Exclusive alloy alternative fusing will be demonstrated. Students are asked to bring their favorite pieces to set. All other mateirals, handouts and use of tools are included in the materials fee paid to the instructor. Years ago I had a couple approach me (hi Maryl & Dominik!) 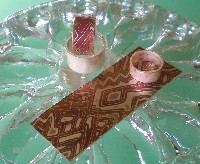 about fabricating their wedding bands out of mokume gane. After discussing it with them it occurred to me that it could be so much more meaningful if they made each others rings instead. Since I teach metalsmithing, I could easily demo the process and guide them while dispensing with the educational process since they weren�t interested in becoming metalsmiths. On a deeper level, the process of making these symbols of commitment were perfect metaphors for the emotional side of joining as a couple: joy, uncertainty, cooperation, fear, nurturing, laughter, discussion, supporting one another, etc. After successfully finishing their wedding bands, Maryl & Dominik posted their photos and story at their web site which is how the next couple; Valentine and Daryl found me. By the time the third couple, Lauren and Trevor, contacted me I was considering writing this up as a bona fide specialty offering! 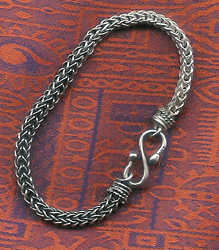 Using fine silver and fusing techniques, we will explore the first in the loop-in-loop chain design series. The traditional open loop-in-loop basket has a light and airy structure that stands alone as an elegant piece or can be embellished to reflect creativity. Students will also make their own clasps. No experience is necessary. The materials fee paid to the instructor covers supplies, handouts and use of tools. 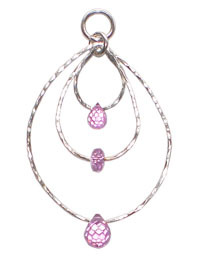 The quadruple loop-in-loop is the quintessential fusing project. This classical design will never go out of style, indeed you'll find it in every major museum that represents historical jewelry. Come play with the big leagues! The materials fee paid to the instructor covers supplies, handouts and use of tools. Don't forget your untinted safety or reading glasses. 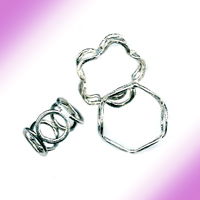 Fast and fabulous, this adjustable ring is a breeze to make. Students will practice several techniques including torch work, hammering, hole punching, filing, riveting and polishing. Are you looking for a simple-one-size-fits-all design to make as gifts or multiples for sale? This is it! Once you get the swing of it, you can make one of these playful rings in less than a half hour. Don't forget your untinted safety or reading glasses. No experience is necessary. The materials fee paid to the instructor covers supplies, handouts and use of tools. The circle is present in thousands of natural forms. It is also called the primary feminine sign. Celebrate this fundamental form in a workshop designed to take fusing students to the next level. Have you fused before? Then this intermediate workshop is for you. After successfully joining several pieces, students will complete their ring by fusing "in the air." No, you don't have to learn to fly, this is much easier! In addition, students will also have the opportunity to experiment and begin to develop their own style. BOYB: bring/buy your own beads for embellishment. The materials fee paid to the instructor covers supplies, handouts and use of tools. Exclusive Sandkühler Studio Design. Tired of having those jump rings fail on you? Are you looking for a permanent way to close them? This basic soldering workshop will teach you everything you need to know in a simple, yet informative way. Bring jump ring repair pieces to spark discussion. Don�t forget your untinted safety and/or reading classes. The materials fee paid to the instructor covers all other materials, handouts and the use of tools. What is a distance learning class? It �s a way for you to learn from anywhere in the world! This distance learning project is the same as the one I teach in the classroom except that it will be delivered to you via the internet. Soldered Jump Rings has been combined with the Soldering with Beads lesson for distance learning. Click here for more information. Students will expand on their basic soldering skills by experimenting with components through shaping heavier gauges, texturing, polishing, hardening and combining metals such as sterling, gold fill, brass and copper. 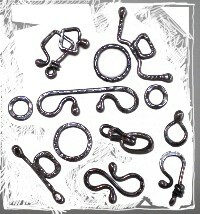 The shapes easily lend themselves to being used as rings, pendants, chain links and earring components. In addition, students will learn how to construct a home made tumbler. Don�t forget your untinted safety and/or reading glasses. The materials fee paid to the instructor covers all the materials, handouts and use of tools. This workshop picks up where the Soldered Jump Rings lesson ended. Students will be looking in-depth at what bead materials are appropriate to use with the soldering process. BYOB: bring your existing beads and plan to buy more after you�ve learned the tricks. The materials fee paid to the instructor covers all other materials, handouts and use of tools. Don�t forget your un-tinted safety or reading glasses. This workshop is designed to give students the maximum time to practice soldering. In addition, topics include fire safety, piercing, patination, polishing, wire-wrapping and how to keep it low-tech and less toxic! We will primarily use sterling sliver. Other metals include copper, brass, fine silver and gold-fill. No experience is necessary. BYOB: bring/buy your own beads for embellishment. The materials fee paid to the instructor covers all other supplies, handouts and use of tools. Exclusive Sandkühler Studio Design. Private lessons and phone consultation are $25.00 per hour per person. Add materials, handouts and use of tools fee when working with (physical) projects at the studio. If you are in the San Francisco Bay Area, or want to catch me on one of my travel teaching trips (see calendar) I'm here for you! Need some help setting up a studio, or jewelry making business? Got ideas floating around in your head (or sketch book) and don't know how to go about realizing them? Could you use an objective professional to bounce things off of? 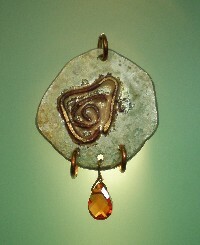 I've been teaching art & jewelry workshops since 1988, academic courses since 1990, and as private lessons since 2000. I even teach the teachers! All these venues give me the advantage of having unique insights from many different angles. What are your goals? In the long run, a private lesson (or good old fashion brain picking session) can save you lots of time, money and aggravation. -And hey, its cheaper than therapy. See more: resume, testimonial, contact me. Terrified of blowing yourself up? Don�t know where to begin learning about how to use a butane torch safely? Not sure which model to buy? Equally curious about where and how you can set up a work space? Iris cover�s all the do�s and don�ts in a humorous yet informative way. You�ll see what decades of classroom experience can do to ease your anxiety and curiosity. Perfect for bringing out the pyro- (but not the maniac) in you!